Wowee - check out that color! And it's actually striped modeling chocolate, not fondant. Amazing. Formal, but still fun. Love it. Plus that graphic black and white pattern manages to be both modern and timeless all at once. Look at those swirls! Totally swoon-worthy. Sharp corners, crisp lines - just perfect. And those graduated colors! I literally gasped the first time I saw this - such great girly goodness. Beautiful. 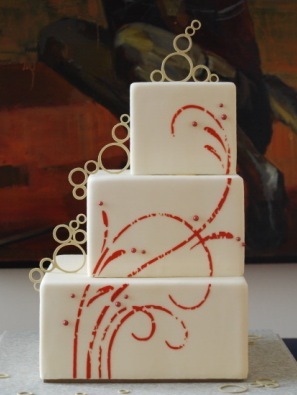 Cake number four, the one with the swirls, is my favourite. I could sit back and gaze at that all day. They are all beautiful. My favorite, the Swirls. That cake looked perfect. I'm pining for that peacock cake. I need one of these cakes before I shuffle off this mortal coil. 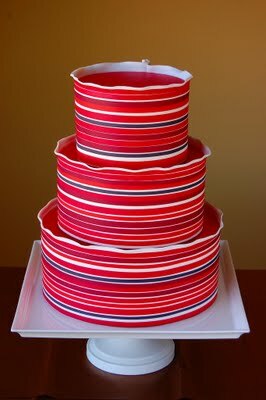 That first one with the chocolate stripes is inspired by an instructional video that I haven't been able to afford yet. The video's version is in blue but just as cool. July 10, 2011 | Amazing Cakes By Vanessa! Wow. Especially like the 'sea foam and crashing waves' cake - you're absolutely right, that's an artists' interpretation, and I want to see it in a museum, stat! I'm always super impressed with bakers who can deal with geometric shapes in their decorations and pull it off. It seems like it could be hours and hours with a ruler and a protractor. those cakes are just amazing! I loved the seafoam one, blue ribbons, yellow & black sunflowers and peacock ones the best! You certainly have the knack for finding the finest! Thanks for a beautiful post. 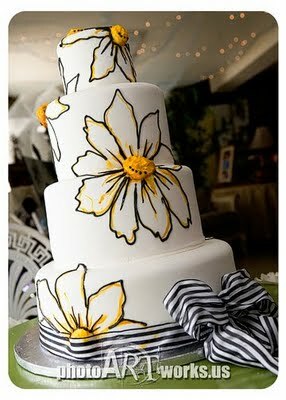 I think the daisy cake is my favourite; the contrast is just so vivid. But they're all truly gorgeous. The pink one reminds me of Kaylee's ballgown in Firefly! I can't even begin to pick my fav. They are so beautiful! 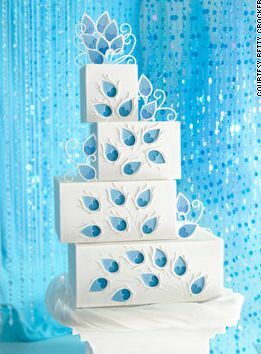 Wow... that sea foam/waves cake is absolutely amazing. Reminds me of a Japanese room screen. Maybe in a pale blue/dark green, it could be seaweed too. But either way, gorgeous. Now I'm babbling. WV: pyromi: Who set the house on fire? Pyro mi! Irrelevant to cakes, but nerdtastic nonetheless: did you know that Norwegian Blue parrots existed once? wv: mirets - Mirets have been burned by some of the wrecks on this site. 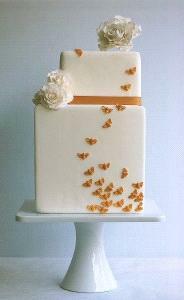 That last cake would be pushin' up the daisies if it weren't wired to the perch. Just sayin'. (not-so-innocent smile). July 10, 2011 | BADKarma! The plumage don't enter into it. It's stone dead. 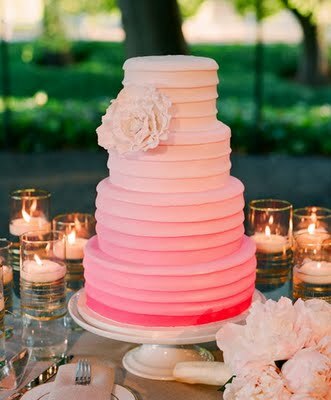 The one cake that you don't know, it's by this lady: http://blog.cakecoquette.com/ (http://www.cakecoquette.com/) If you go down about six posts on the blog, you can see where the ribbon cake was featured in Brides magazine. I LOVE her stuff! She does some great designs. I love the daisy cake...and I love Johnnie too! Something Sweet Cake Studio is my favorite bakery in the world. Johnnie is wonderful to work with and makes the most amazing treats! I hope her cakes are never on a WRECK post! Did anyone else see "Modern Marvels" and expect Marvel Comics-inspired cakes? I always enjoy perusing the cakes on your site. Usually just for the sake of a good laugh, but sometimes for some good ideas as well. Admittedly, I was a bit disappointed after reading the title "Modern Marvels" and then seeing wedding cakes. I was hoping for Marvel Comic cakes, but that's the geek in me. These are quite lovely, but now I have a hankering to see some good Marvel Comics cakes. Do you think that might come along some time soon? All these gorgeous cakes make me think of the Cakegirls. I miss seeing their beautiful work. my favorite is the first one. looks sort of like those dish ware sets from crate and barrel. 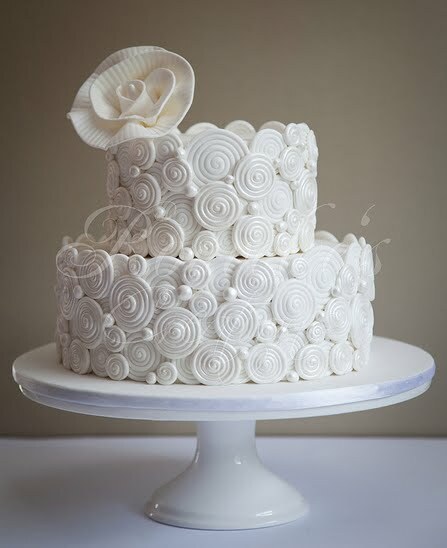 I've taken a couple of classes from Richard of Baking Arts (the first cake shown) and the second class I took was learning to work with modeling chocolate - no easy task. He is an incredibly skilled artist! The penultimate cake really is pushing up the daisies (note the 3-D effect). "The plumage don't enter into it." All are very beautiful, my favorites are the Daisy and the Peacock. Great work! Elegant! Elegant! Elegant! Terrific stuff. WV: demadmen --the creators of all the CW cakes you see the rest of the week after Sunday. Wow all those cakes had such gorgeous colors. I loved them all and wouldn't even dare cut into them lol. I don't know which I enjoy more: the wrecks or the sweets! The first one is my favorite, but they're all lovely. I love the peacock one. I'm particularly impressed by the bottom edges of the ones not lined with some kind of bottom border, especially the sea-style one. 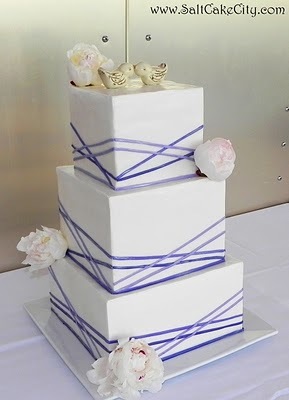 It's hard to get bottom edges right; that's why most of us cheat with ribbons, rolled borders, piped borders, etc. And those "bubbles" are to die for. LMAO @ the Monty Python reference!! One of many reasons I love reading your site daily, Jen!! "I whiesh, I whiesh, I whiesh..... for a pink pony"
These cakes are absolutely stunning! 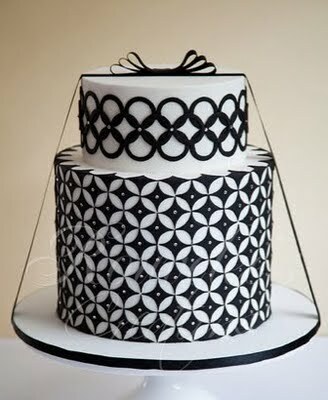 I love how they incorporate architecture and art into the cake designs.